Learn how to sign up for a Save To Win account and start saving today. Are You a Credit Union? Learn how Save to Win can help your credit union grow savers. Check out the media attention our program has received over the years. Helping credit union members save money and build wealth is a cornerstone of the credit union social mission. No matter what they're are saving for, every time a credit union member makes a $25 deposit into their Save to Win account, they’re entered into a drawing to win cash prizes! 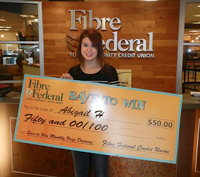 Check out what credit unions are participating in Save to Win so you can start saving today! Forbes: Will Prizes Get More Low-Income People To Save? Check out these recent winners!! Candice M. from One Detroit Credit Union, Kevin M. from Mutual 1st Federal Credit Union and Abigail H. from Fibre Federal Credit Union. You could be next!! Contact a participating credit union to join Save to Win today.